Many of the regulations that allow dairy products to carry the label “certified organic” revolve around farming practices. In general, organic milk should come from cows that eat only organic food and are not enhanced with hormones, antibiotics or other chemicals. In February 2010, the USDA tightened its definition of organic milk to include stricter regulations about the pasture access. The new guidelines define organic milk as milk from a cow that grazes on pasture at least four months out of each year, with at least 30 percent of the feed coming from grazing. The old rules simply stated that animals had to have “access to pasture.” Ranchers must also have a plan to protect soil and water quality. When breastfeeding women rely on organic milk vs. regular milk, their babies benefit from up to 36% higher levels of the heart-healthy essential fatty acid CLA (conjugated linoleic acid)1. Conventional milk contains an average of 2.5 pesticides, according to a USDA study of 788 milk samples in 2005. The Organic Milk Suppliers Cooperative sponsored an independent study that found that organic milk contained an average of almost 70 percent more heart-healthy Omega 3 essential fatty acids than conventional milk. Other studies have revealed higher levels of other nutrients as well, such as vitamin E and beta-carotene. 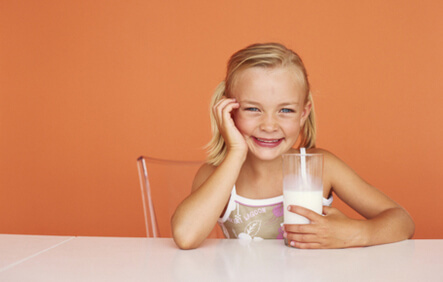 Another study showed that the incidence of eczema in young children was reduced by 36 percent when children consumed organic dairy products. The benefits of buying organic dairy products go beyond nutrition. More than 200 million acres of farmland in the US are dedicated to growing feed for livestock. Choosing organic dairy products creates a market for farms that avoid pesticides and other farm toxins. If you need or want to avoid dairy products, organic soy milk, yogurt and other soy products are nice alternatives that allow you to reap the benefits of milk’s best nutrients while still choosing organic. 1Influence Of Organic Diet On The Amount Of Conjugated Linoleic Acids In Breast Milk Of Lactating Women In The Netherlands, L. Rist, et. al., British Journal of Nutrition, April 2007.